Air Kicks or Use Kicking Paddles – Rather than kicking a heavy dense target (i.e. heavy bag, BOB or Wavemaster), you can throw “air kicks” (where you practice a kick without a target) or use a light weight kicking paddle. This forces martial arts students to concentrate on the technique and their balance versus using the large kicking bag to help “stop” an out-of-control and off-balance kick. Agility Training – Agility drills, especially where a martial artist practices crossing their feet or is making quick changes of direction, are used to work on greater stability during sparring and self-defense situations. Some of these agility drills include Carioca, River Dance, T-Test, etc. 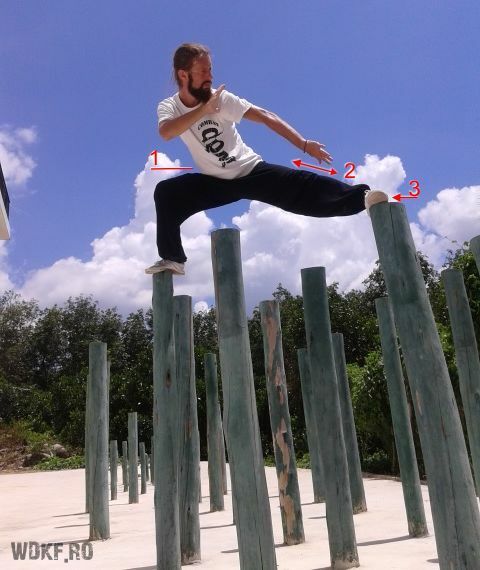 Blossom Pole Training – If you are truly inspired, you can try the balance work done with Kung Fu’s Plum Blossom Pole Training (or known as Mei Hua Zhuang in Chinese). You often see this balance training in old Kung Fu movies. Balance Boards & Wobble Boards – Train with a balance or wobble board. These instability devices will help to improve your balance and core strength. Balance Pads – Train with balance pads. These are large foam pads that allow feet to “sink” slightly and thus add further instability to balance training. Bosu Balls – Train with a Bosu ball. This is another piece of sports equipment focused on balance training. Bosu Balls look like a ball cut in half and martial artists can use either the flat or curved side in order to improve their balance. Balance Pods – Balance pods are like miniature bosu balls that are used for dynamic balance and static balance training. Sand – Train in a sandy environment (i.e. at the beach or in the large sand “boxes” used by some professional athletes). The shifting movement of sand adds more footwork instability and thus helps work on your balance. One Legged Exercises – Standing or exercising on one leg is a classic martial arts balance training technique. It can also be done while stretching or performing strength training exercises in order to add greater difficulty to the balance training. Below are some examples of stretches and exercises performed while standing on one leg. Agility Ladder Drills – Martial artists often perform one legged agility ladder drills (i.e. hop on one leg from square to square on an agility ladder) in order to improve their balance & agility and strengthen their legs. Ball Toss Balance Training – Stand on one leg and catch a ball without putting your foot down. This provides greater balance training because you must maintain balance while coordinating multiple muscles in order to catch the ball. Cross Body Leg Swings – This leg swing balance exercise involves moving a leg sideways across your body while standing on one leg. Dancer’s Pose – This is an advanced Yoga pose used for balance training. Heel-to-Toe Walk – To make this balance exercise more difficult, try doing it with your eyes closed. Side Leg Swings – This leg swing balance exercise involves moving one leg up sideways as far as it can go (while standing on the other leg). The leg swing does not cross the other leg (unlike cross body leg swings). Single Leg Balance Reach – This balance exercise also works your core, leg, glutes and ankles. Single Leg Medicine Ball Diagonal Chops – This medicine ball exercise works on your balance as well as your upper body & core strength. Single Leg Standing Exercise – Standing on one leg is one of the most basic balance exercises. You can make it more difficult by closing your eyes. Standing Big Toe Pose – This is a Yoga balance and stretching exercise. Standing Quad Stretch – This stretch is also a great balance exercise. Standing Splits – This balance exercise requires extreme flexibility. Stork Stance Exercise – The stork stance exercise is a one legged balance exercise that also works your core muscles. Tree Pose – This one legged pose is a Yoga balance and stretching exercise.